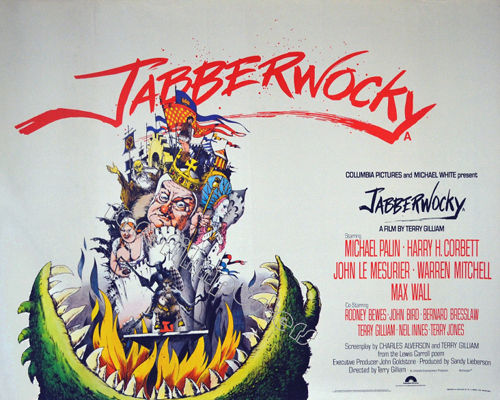 Terry Gilliam's Jabberwocky (1977) is an odd little movie from a director known for odd medium-sized ones. 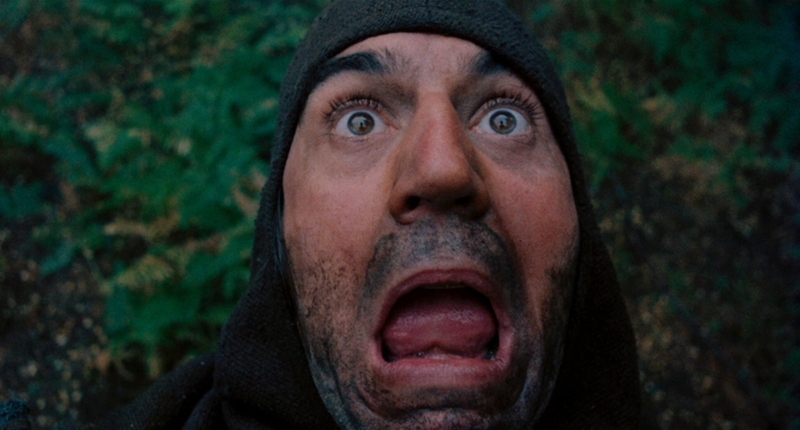 Conceived during the production of Monty Python and the Holy Grail (which Gilliam co-directed and co-starred in), this medieval black comedy serves as the director's first solo effort outside of the popular British troupe. He would later direct landmark films like Brazil and 12 Monkeys; assuming you've seen those and are curious about Gilliam's debut, don't set your hopes too high and you won't be disappointed. It's a production that feels like baby steps before the sprint of Gilliam's more refined efforts, though his unique visual approach and comedic Python roots are pushed to the foreground. Loosely based on Lewis Carroll's nonsense poem of the same name, Jabberwocky tells the tale of an eponymous dragon that terrorizes the hapless citizens of medieval England. The most hapless is Dennis Cooper (fellow Python Michael Palin), a young tradesman who sets out to make a name for himself after his disappointed father dies. Dennis' lukewarm love interest Griselda (Annette Badland, EastEnders) and her father Mr. Fishfinger (Warren Mitchell, Till Death Do Us Part) barely even acknowledge his departure. From there, he bumbles through a series of mishaps on his way to---and within the walls of---a bustling castle town that's home to a jousting tournament. Winners are pitted against the Jabberwocky, earning the chance to become a prince if the beast is slain. Losers get a lance through the chest. Many parts of Jabberwocky play like Holy Grail leftovers; this isn't always a bad thing, but definitely feels like a handicap. The characters and medieval backdrop (and, of course, its silly and often pitch-black sense of humor) are similar in tone, yet rarely achieve the same heights of Jabberwocky's big brother. Early on, the film has little trouble maintaining interest as the stage is set: Palin's Dennis Cooper is an entertaining fellow, the threat of the beast is ever-present, and Gilliam's trademark visuals keep us on our toes. His sarcastic portrayal of bureaucracy is most certainly on display here, though it would become more focused in later efforts like Brazil. But this episodic adventure is paced rather slowly and its dreary atmosphere wears out its welcome long before the credits roll, making initial and subsequent viewings of Jabberwocky seem like every one of the film's 105 minutes. It's just not all that funny, to be honest. 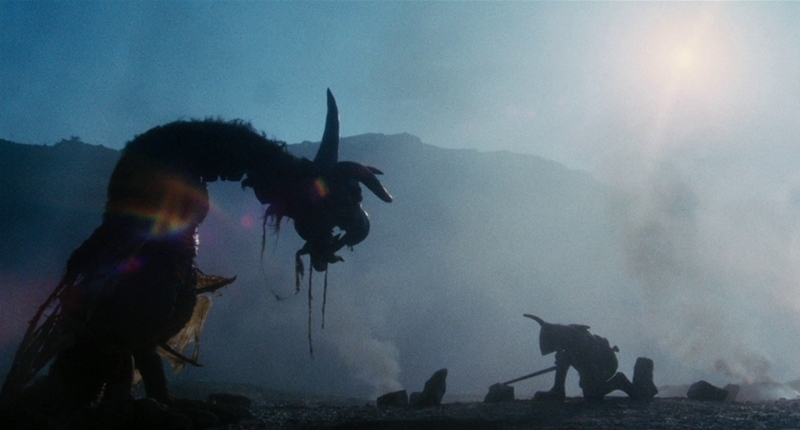 Despite the film's glacial speed at times, Jabberwocky has its moments. Palin turns in a likable performance even when he's still in Python mode, while the film's impressive set design and appearance defy its tiny budget. But Jabberwocky is not a great film, regardless of its new place in The Criterion Collection or the sparkling 4K restoration it's been granted, and would likely be forgotten without the success of Gilliam's later works. As such, this is a disc for established fans only; they'll be absolutely thrilled with its upgraded appearance and wealth of old and new supplements. Previously released on DVD by Columbia/Tristar in 2001 and as part of Sony's Choice Collection in 2014, Jabberwocky has never looked all that great on home video...until now. Criterion's 1.85:1, 1080p transfer is sourced from a new, director-approved 4K restoration by BFI National Archive and The Film Foundation. The result is an image that's much richer in detail and grain than previous efforts; Jabberwocky still looks murky and rough around the edges, but in a much more organic and purposeful way. Image detail, contrast, black levels, texture, and just about everything else here looks better than expected, which I'll admit increased my enjoyment of the film by a small margin. My only minor nitpick is a trend with many recent Criterion discs: the color palette leans heavily towards blue/cyan this time around, and it might take some getting used to for those who have seen it many times before. Nonetheless, it's doubtful that Jabberwocky will ever look better on home video, unless Criterion finally jumps on the 4K bandwagon at some point. Unlike both earlier DVDs, Jabberwocky drops its original 2.0 track and leaves only the 5.1 remix (now presented in DTS-HD Master Audio, obviously), but the difference here is that the 5.1 remix is a new one supervised by Gilliam himself. While there's only so much power and depth you can wring out of limited source elements, this is an admirably good mix and doesn't sound nearly as gimmicky and hollow as the older one. Dialogue and background effects are well-balanced with modest depth and solid dynamic range, with music cues that are mixed well and a sporadic amount of channel separation. LFE and surround activity are limited but noticeable. Overall, it's a great-sounding mix but I'm surprised the 2.0 track isn't here as well. Optional English subtitles have been included during the main feature only. As usual, Criterion's interface is smooth and easy to navigate. This disc is locked for Region A players only; it's packaged in Criterion's stocky keepcase with poster-themed cover artwork. A fold-out Booklet includes notes about the restoration, production photos, and a new essay by film critic (and long-time A.V. Club editor) Scott Tobias. Several new supplements were created for this Blu-ray, and a few vintage goodies have been unearthed as well. 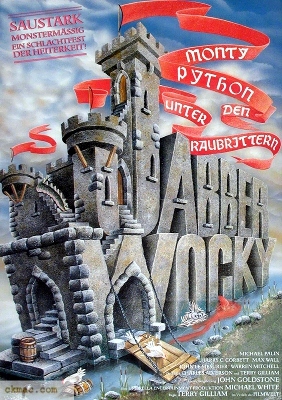 thanks The best is "Jabberwocky: Good Nonsense", a new retrospective documentary (41 minutes) featuring director Terry Gilliam, producer Sandy Lieberson, and actors Michael Palin and Annette Badland. Topics of interest include Lewis Carroll's original poem and other works, the short turnaround time between early development and shooting, Python popularity, working on a 500,000 pound budget, casting Michael Palin in the lead role, Gilliam's directing style, Dennis's "love potato", the influential paintings of Bosch and Bruegel, cannibalizing other film sets, creative corner-cutting, and much more. On a similar note is a delightful new Video Interview with artist and frequent Gilliam collaborator Valerie Charlton (14 minutes), who designed the Jabberwock and shares her collection of behind-the-scenes photographs, artwork, and other memorabilia while talking about her unique experiences during the film's production. Three vintage odds and ends are here as well. 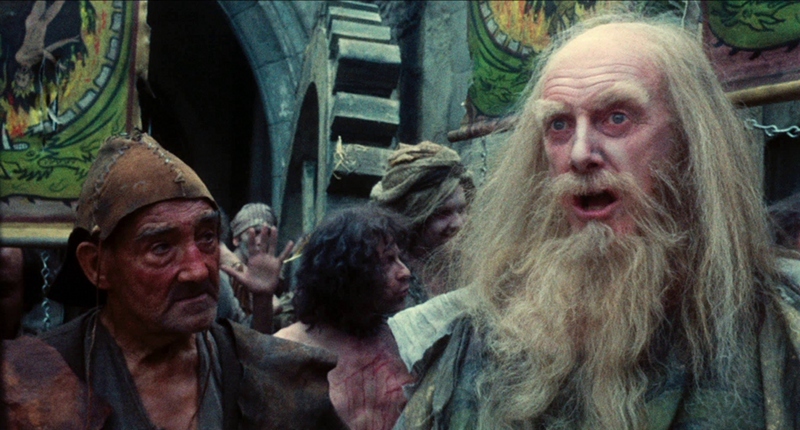 These lead off with a 1998 Audio Interview with cinematographer Terry Bedford (23 minutes), who speaks about working on both Monty Python and the Holy Grail and Jabberwocky, his early career, shooting in Scotland, and more. The film's Original UK Opening Sequence (3 minutes), presented in open-matte 1.33:1, features a different title card and lacks the paintings and voice-over narration added to the director's preferred American release. Finally, we get a brief but welcome reading of Lewis Carrol's "Jabberwocky" Poem by Michael Palin and Annette Badland (2 minutes), cut from their recent interview session. Most of the old DVD extras are here too, including an Audio Commentary with Terry Gilliam and Michael Palin, a Sketch-to-Screen Comparison of Gilliam's storyboards, and the film's Theatrical Trailer. Die-hard fans of Jabberwocky will be glad to have these on board; aside from a missing poster gallery, this is pretty much an all-inclusive release. Terry Gilliam's Jabberwocky isn't a particularly memorable adventure, but it's a fascinating little slice of film history for the soon-to-be celebrated director who would continue with the excellent Time Bandits and Brazil during the next decade. Still, there's a certain level of enjoyment here, including a likable lead performance by Michael Palin and a substantial atmosphere that defies its extremely modest budget. What's more is that Criterion's new Blu-ray treatment is almost embarrassingly lavish: from the striking new 4K restoration to a director-supervised 5.1 remix and a wealth of interesting bonus features, it's a well-rounded release that die-hard fans are sure to enjoy. Even those on the fence (like myself) might find themselves tipped in the film's favor by Criterion's attention to detail. Recommended.